1Click the Insert tab and then click the Symbol button in the Symbols group. The Symbol dialog box appears. 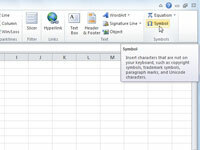 The Symbol dialog box contains two tabs: Symbols and Special Characters. 2(Optional) Click the Font drop-down list button and select a different font. 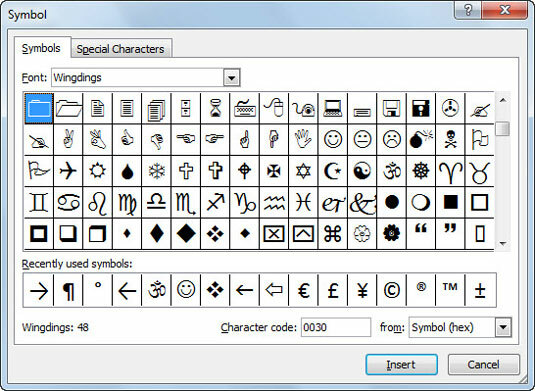 Check out the Wingdings and Webdings fonts to see a wide variety of symbols that you won’t find with most other common fonts. 3(Optional) Click the Subset drop-down list button and select the desired character set. These subsets include foreign alphabets, accented characters, and mathematical operators. 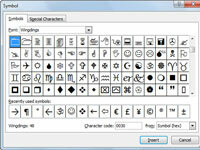 4Select the desired symbol on the Symbols tab; or click the Special Characters tab and select the desired character. Notice that the most recently used symbols appear near the bottom of the Symbols tab. 5Click Insert to insert the symbol or character. The Symbol dialog box stays open so you can insert a string of special characters without having to re-open the dialog box for each one. Repeat steps 2 through 5 for each character or symbol you want to insert. 6Click Close when you're done adding symbols and special characters. The inserted symbols or characters appear in the worksheet. 7Press Enter to complete the cell entry. If you need to add more (regular) text to the cell entry, you can continue typing after you click Close and before you press Enter.